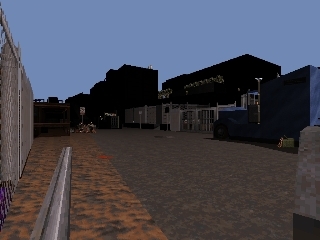 Duke Nukem Repository » Downloads » Maps & Addons » Duke 23:4, by Scott "Forge" L.
A fairly big, and very immersive canyon-styled map by the author of Duke 3:16, making for his second ever single map release. While the forementioned prequel was already rather outstanding for a debut map, for this one Forge has taken things even further and managed to wrap up not less than a high-quality level, that goes as far as baring some resemblances with Gambini's work in terms of visual realism and eye-candy (the author has his own unique style, though), but also makes for a solid experience on the gameplay side of things. In this level you will get to visit a variety of locations such as an abandoned building (my personal favorite section of the map), a railway station with an arcade room and a little restaurant, a parking lot, a windmill, docks... a lot of attention has been put into the detailing and everywhere you will stumble upon meticulous little constructions, cool-looking vehicles and clever spritework, including a lot of machines and random stuff you've never seen in Duke before which contributes a lot to the atmosphere. You will also get to cross what's probably the most impressive bridge ever built in a map for this game. 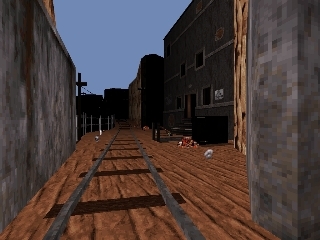 The level is basically divided into two sections - during the first two thirds of it, you will be blasting liztroops, pigcops and lizmen in the forementioned canyon-looking environment, making for some solid, enjoyable firefights in fairly open environments with a lot of random stuff everywhere to take cover from. 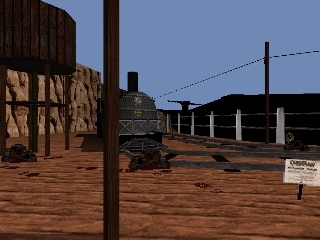 Then the last third of the map takes place in the railway station, with a lot of indoor fights against tougher enemies such as protector drones or octabrains, as you fight your way to the switches scattered in every single room in order to get out and away. The gameplay itself is well-balanced and there's is nothing to fault whether it comes to the enemy / ammo ratio, or the monster placement. The map is of average difficulty, and your progression will only be made easier if you happen to find the numerous secret places cleverly hidden throughout the whole map. Overall a solid release, and a very enjoyable 25-minute-long level that every Duker should have a reason to try out. Enjoy this little gem ! Construction Time      : Six month period. middle of the restaurant floor. bit polymost and it looks crappier than normal; it's nobody's fault but your own. Page generated in 1.8291 seconds.